Dr Mohammed Alhaj Hussein and Saudi Green Building Council would like to present the green concrete workshop at any country worldwide . The seminar topic is : Natural Pozzolan - Rebirth of an Ancient proven Technology: Establishing the importance of World Lava in the Green Concrete, Green Building and Sustainable Development. - Enclosed , The first workshop in Europe and Russia about the use of natural Pozzolan and other Pozzolans in green concrete , green building and sustainable Development . 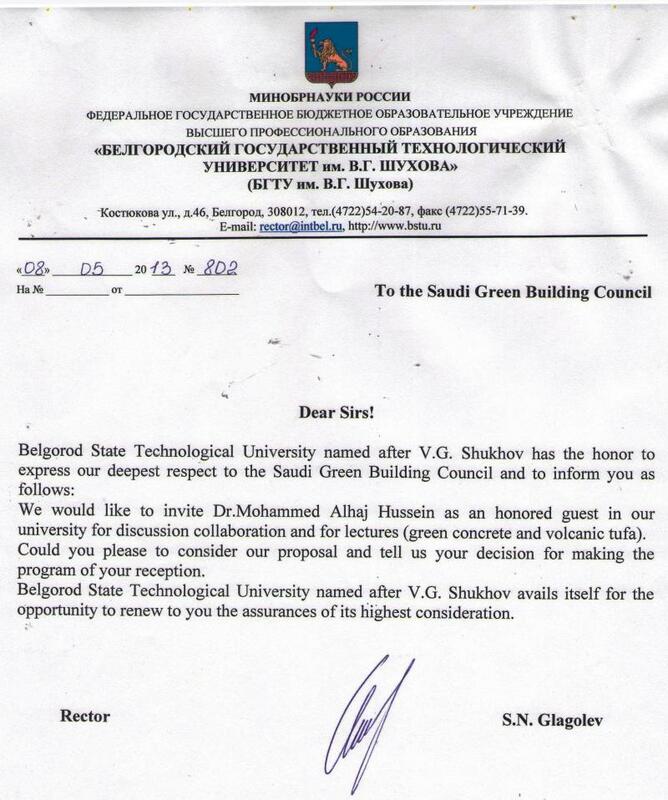 It was presented at BSTU, Belgorod, Russia, by Dr. Mohammed Alhaj Hussein , board member of Saudi green building council . - Enclosed , The first workshop in Europe and Russia about the use of natural Pozzolan and other Pozzolans in green concrete , green building and sustainable Development . It was presented at Belgorod, Russia, by Dr. Mohammed Alhaj Hussein , board member of Saudi green building council .